Your Blood Sugar Levels ? The glycemic index is a value assigned to foods based on how slowly or how quickly those foods cause increases in blood glucose levels. Also known as “blood sugar,” blood glucose levels above normal are toxic and can cause type 2 diabetes. The slow and steady release of glucose in low-glycemic foods is helpful in keeping blood glucose under control. overweight people and health disorders that are linked with obesity. 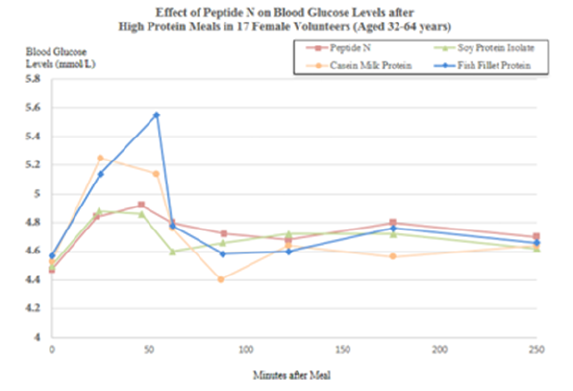 different proteins – Peptide N, fish fillet, casein milk protein and soy protein isolate – on blood glucose levels in 17 female volunteers (aged 32-64 years). Each volunteer consumed these proteins in random order, always as part of composite meals of similar macronutrient composition with a 1-week gap between each meal. Blood samples were taken from each volunteer to assess levels of glucose, insulin and other biomarkers in the fasting state and 7 times after each meal, for up to 240 minutes. This study found that Peptide N supplementation resulted in a significantly blunted blood glucose response than with fish fillet protein or soy protein isolate, lowering the risk of obesity and alleviating symptoms of type II diabetes. In other clinical studies, Peptide N has also been shown to reduce the appetite and promote satiety via its actions on metabolic hormones. PEPTIDE N, ONE OF CELERGEN’S INGREDIENTS IS A MARINE PROTEIN HYDROLYSATE PROVEN TO REDUCE THE DIETARY GLYCEMIC INDEX OR GI. PEPTIDE N HAS BEEN SHOWN TO PREVENT UNHEALTHY BODY FAT ACCUMULATION, WHICH AIDS IN MAINTAINING A HEALTHY BODY WEIGHT AND REDUCING THE RISK OF OBESITY, WHILST ALLEVIATING SYMPTOMS OF TYPE II DIABETES.